I love it when Tuesday starts with an amazing deal! I’ve been shopping at Express for as long as I can remember and to this day they remain a closet staple for both work and casual items. For Spring 2018 I’ve been possibly more pleased than ever with selection. This season has some of the most well-made clothing I’ve ever purchased at Express! Today, Express is offering 30% off storewide, online only. If you haven’t been shopping at Express recently, this is your chance to grab what you’ve been missing out on! From trendy casual pieces to timeless work cornerstone items, your wardrobe deserves what this special promo offers. Some parts of the country are already short-sleeve warm, but plenty of us are still solidly in coat weather! As the sun begins to warm us ever more I’m on the hunt for transitional jackets that will keep me warm yet also let a cool breeze in every now and then. I own and absolutely love the Oversized Knit Cover-Up ($56, today only) you see above. Hopefully you caught my ideas on how to style this kind of coat — and if not, open that post now and read it after you’re done here! An oversized blazer like the one above can play many roles: it can be the finishing touch to a casual office outfit, it can be a jacket on days where work is a possibility but not a guarantee, it can be something you leave in your office for surprise client visits. Though longer, here’s another option that can gracefully play all those same roles. When I was first starting out in my professional career I worked in a lightly suited office, meaning I didn’t technically have to wear a suit everyday but I did have to look very polished and professional. No jeans; even khakis were a stretch. Express was terrific then and remains a favorite spot of mine to find work-ready pieces that don’t break the bank. The blazer above has fantastic tailoring for the price point — people always ask me where I purchased it and assume the answer is a much higher-end store. You can surprise yourself with how good you look in Express’s many blazers! When it comes to work clothing, tailoring is a key. A few darts and seams are all a girl needs to look thoroughly talented at the office. 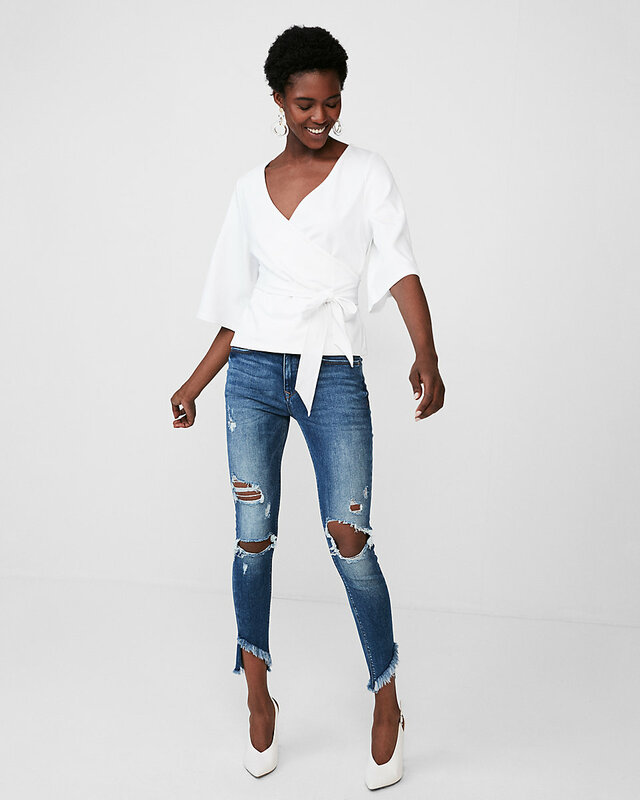 I cannot say enough good things about the blouse shown above, which also comes in a slim cut for smaller busts, and how it somehow amazingly fits any body type beautifully! The blouse can be work with long sleeves or button-tab rolled sleeves, and tucks seamlessly into pencil skirts like the High-Waisted Clean Front Pencil ($48, today only) which is also in the photo above. And oh how I love Express’s many styles of work pants. I have to admit I copied this entire look recently for a work meeting with one of our high-end fashion clients, and they adored it. It was a huge sigh of relief to me how easy it was to put together a look for that somewhat stressful meeting; Express made it easy with a great range of waist and hip fits in their work pants. It’s not dress pants that Express excels at either — their jeans are also so much fun to pick and choose from! I have several pairs that I’ve tried on and loved (or purchased) in my shoppable boutique at the bottom of this post. Need some shoe ideas for all these jeans? I’ve got my eyes on these 5 pairs for Spring. In my early 20s, I could reliably find just the right (short) going out dress at Express! These days I’m more into the knee-length frocks, and Expres’s options there are anything but frumpy. I’m impressed by their wide range of options, from sexier yet still long enough dresses to on-trend and wearable dresses to classic pieces like the dress above. You’ll find lots of great options in the shoppable boutique at the end of this post. I’ve hardly touched on Express’s casualwear — there’s plenty to love in that assortment too! As a tall girl it’s been harder and harder to find camis, tank tops, tee shirts, and regular shirts that are long enough for me. I love that Express carries many long tops! It makes my outfit assembly so much easier. Express’s site is huge with an overwhelming number of products, so I’ve whittled down the nearly 1000-product catalogue to the picks you’ll love for this special offer. All prices shown in the boutique are before the 30% off, which reflects at checkout. Hi Roxy! This is OT but I just went to the Nordstrom homepage & it says that Anthropologie Home will be carried there starting in March. Interesting right? Did everyone else already know about this? Hi Sara! Pretty cool, right? I was going to wait until my coverage of their quarterly call to discuss it, but we can totally talk about it now too! They announced this yesterday. Since I don't have a Nordstrom near me (YET, the NYC women's store opens next year) it doesn't really make much of a dent for me, but it's very cool news for those near Nordstrom! I'm no help on that top. Maybe it's not online yet? Oh no I missed it! Ever since I saw the oversized knit cardigan on your earlier post I have wanted to buy it! I didn’t get on here yesterday and now I’m a day late a a few dollars short to get that great deal! I’m sorry I missed 30% off. Thank you though Roxy for telling us about this jacket/cardigan, I will eventually get it. I have never shopped at express and hope to get it on sale. Bummer! But, I have to think this coat will hit sale sometime in the next few weeks. So there is surely good news ahead.